Do you have that one weekend getaway spot that you tend to visit again and again? For us, it’s a small town an hour and a half away called Niagara-on-the-Lake. The famous falls are close by, but while both are very busy tourist areas, this town has a very different style and appeal. Boutiques, restaurants and theatres have taken up residence in historic buildings, and the town boasts many wonderful hotels and B&B’s. Once the crunch of tourists clear out on summer evenings (or in the off-season), I find this town at its most charming. Strolling through the village, biking along the river path, or sitting down at the waterside park is a great escape from the city… and we’ve done it more times than we can count. In recent years, I’ve done a bit of sketching there, but this is the first painting of Niagara-on-the-Lake I’ve finished. 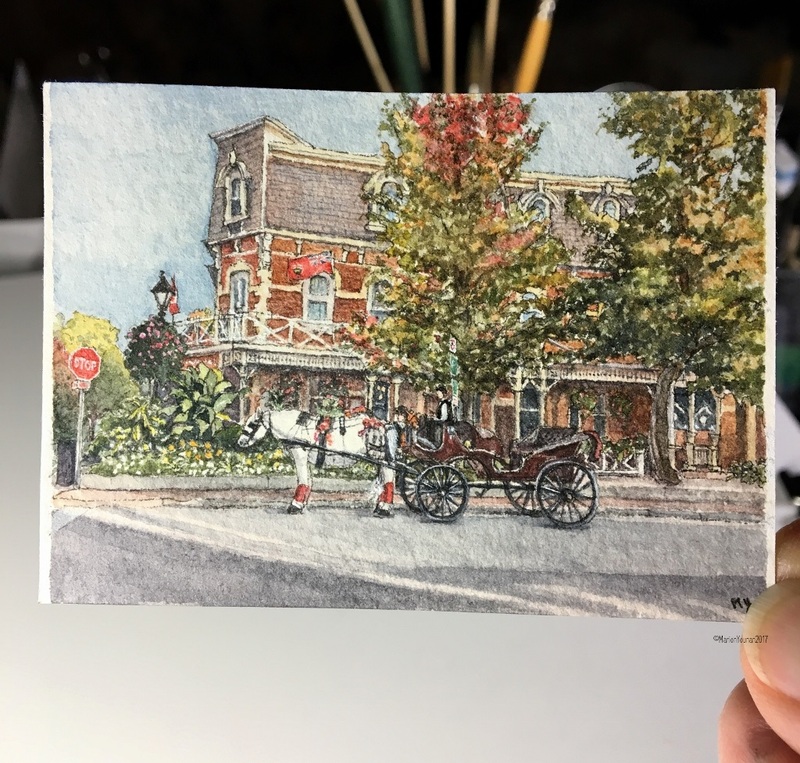 I chose to paint one of its iconic buildings, the Prince of Wales Hotel, built in 1864 (before Confederation), and it so happened one of the period buggies was parked alongside. I love the French-inspired architecture of this building, as well as the incredible landscaping around it. I’ve not stayed here but have indulged in High Tea, which made me feel as if I was in another era but without the corsets and big feathered hats. 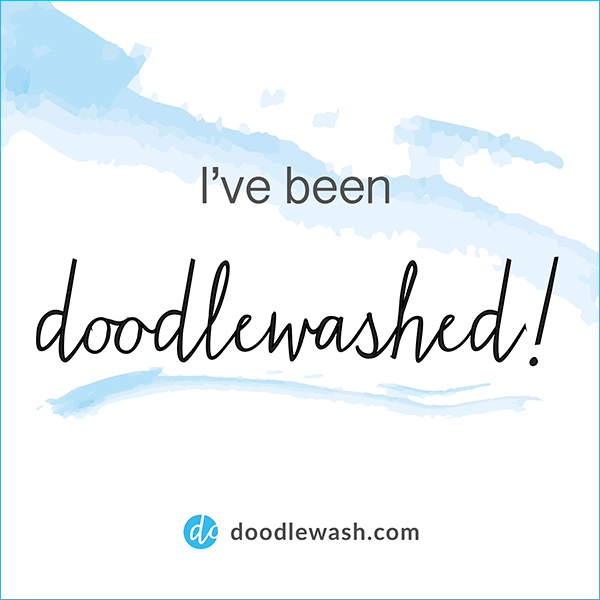 A must-do, if you are in the area. 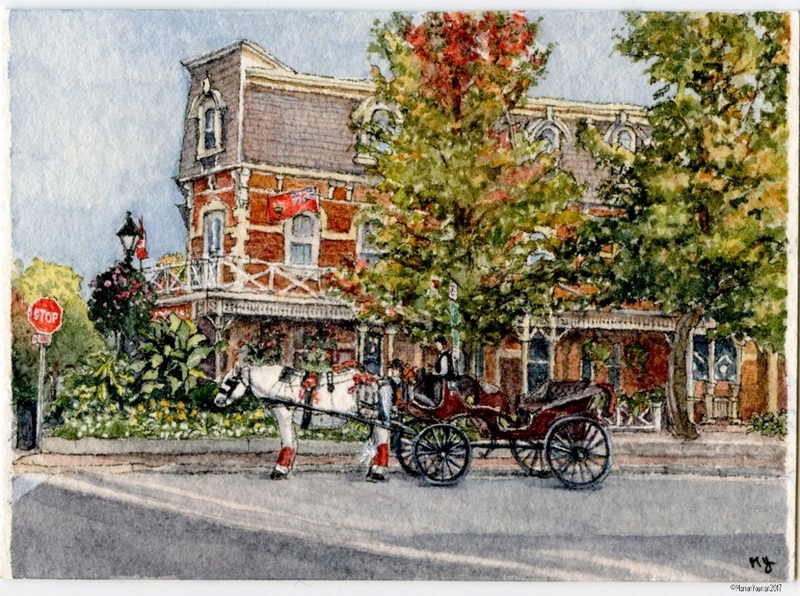 Here is Mini Vacation piece #80, “Niagara-on-the-Lake Transportation” – an ink and watercolour celebrating Canada’s heritage and celebrating great Canadian Weekend Getaways!